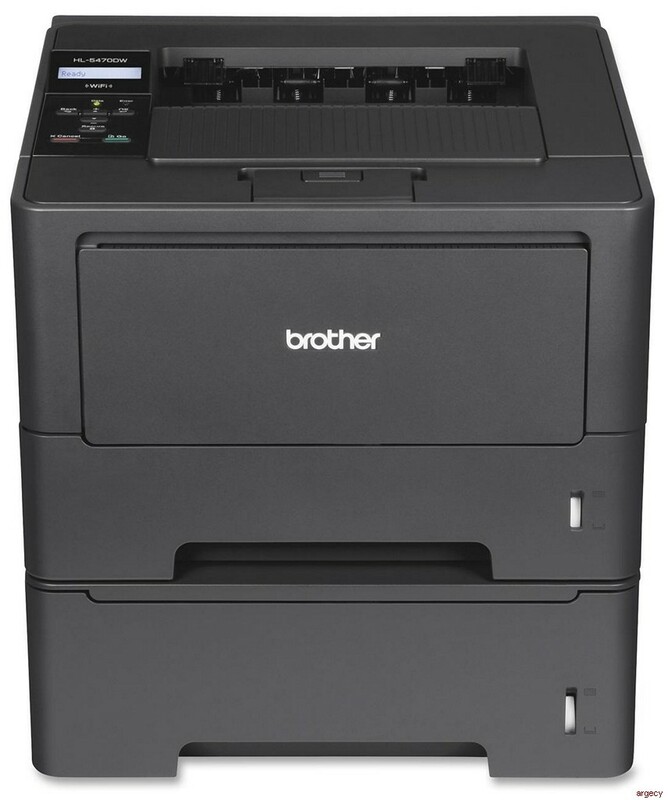 The Brother HL-5470DWT is a cost efficient, reliable laser printer with a large paper capacity that is ideal for busy offices or small workgroups. It features fast, monochrome printing at up to 40ppm and dual paper trays for flexible paper handling and fewer refills (800 sheet total capacity). It also offers automatic duplex printing for producing professional two-sided documents and uses a high-yield 8,000-page replacement toner cartridge to help lower running costs. Users can share the HL-5470DWT with others on their network via its built-in wireless 802.11b/g/n or Ethernet interfaces, and wirelessly print from their mobile device via: AirPrint, Google Cloud Print, Brother iPrint&Scan, Cortado Workplace and Wi-Fi Direct. Large paper capacity. The Brother HL-5470DWT features an adjustable 250-sheet capacity paper tray, a 500-sheet capacity paper tray and a 50-sheet capacity multi-purpose tray for printing letterhead and custom paper sizes up to legal size. Flexible connectivity. Built-in wireless 802.11b/g/n and Ethernet network interfaces allow you to share the HL-5470DWT with multiple users on your network. Eliminate extra cables and conveniently place your printer with wireless networking or connect locally via its Hi-Speed USB 2.0 interface. Advanced security features. Provides a wide-range of security features including: secure print, Secure Function Lock, Enterprise Security (802.1x) and more. Outstanding customer support. The Brother HL-5470DWT offers a 1 year limited warranty with free phone support for the life of your product. First Time to Print less 8.5 sec. Unit Dimensions (W"xD"xH") 14.6" x 15.1" x 15.2"
Carton Dimensions (W"xD"xH") 26.1" x 19.8" x 26.4"
Unit Weight (lbs) <30.0 lbs.